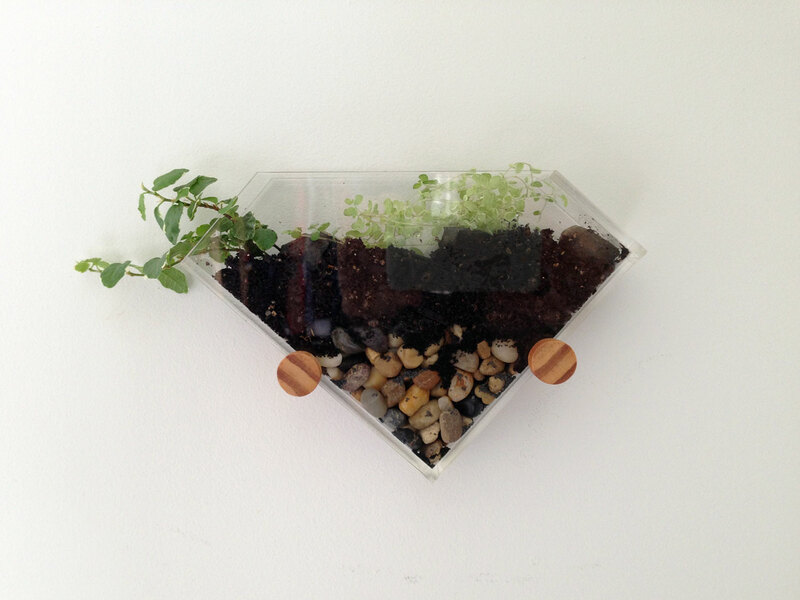 I wanted to make a wall mounted terrarium that didn’t stick out of the wall too far, I had quite a bit of trouble finding a container that would work. I ended up getting a couple of acrylic containers from a Japanese homeware store. The beauty/jewellery section had quite a few drawers and things that were made from it. The rectangle terrarium is made from a drawer (I used the outer bit, not the drawer) and I have no idea what the other one was meant to be used for. It’s supposed to sit up on it’s side, kind of like a brochure stand. I made the wall fixtures from dowel and metal shelving brackets, if you go to the end of this post you can see how those were done. 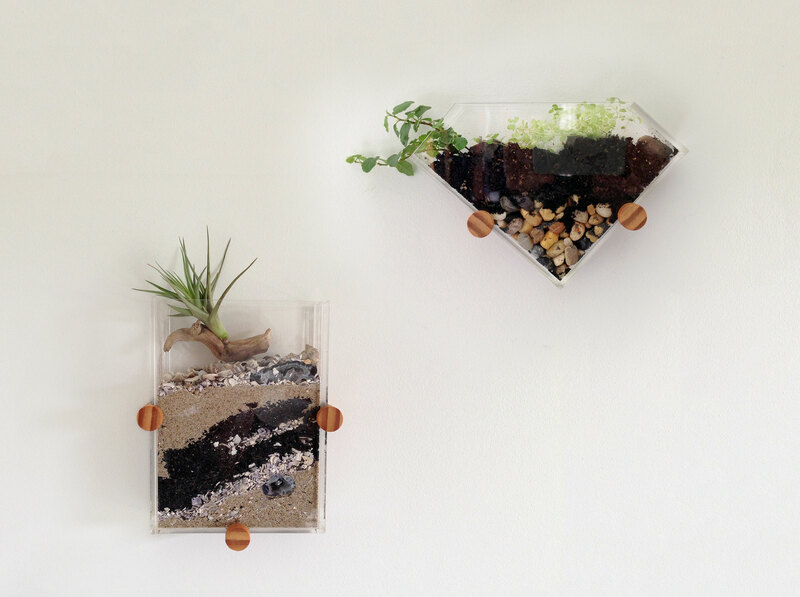 This terrarium uses layers of sand, an air plant, driftwood and a cut geode. I collected different types of sand and broken shells from local beaches. I washed them because I didn’t want the terrarium to be stinky. For each sand type I put it in a colander that was lined with fabric and poured boiling water over it. When it had drained off I lifted the fabric out, put it in a container and left it in the hot water cupboard to dry. The geode is hot glued to the front of the acrylic container. I put the glue the whole way around to create a seal so the sand wouldn’t fill it in. Layering the sand was harder than I thought. I had originally wanted a broken shell layer lower but when I put sand over the top it was so fine that it filled in all the gaps and made it so you couldn’t see the shells at all. 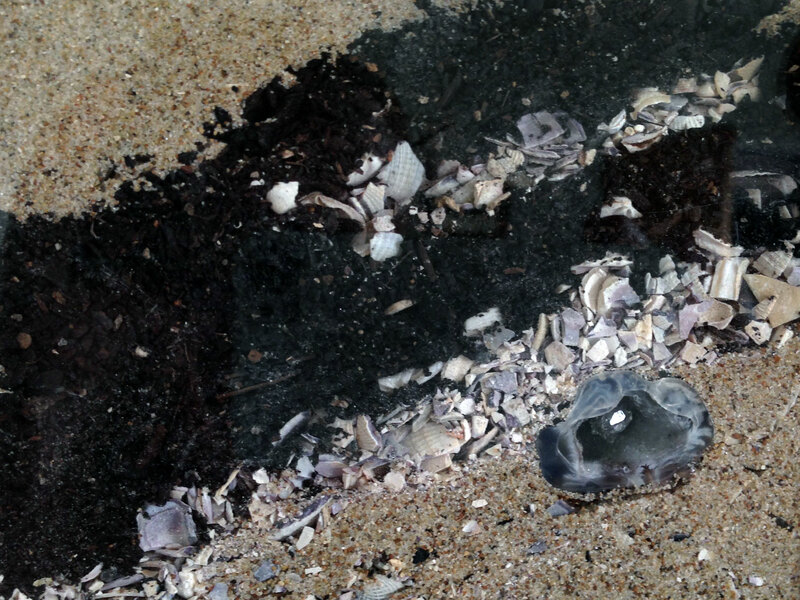 The black layer is finely broken up bark that was also from the beach, that layer seemed to create a barrier so I could put the sand above it and not have it fall through so much. The layers are quite fragile, if it was shaken they’d probably be lost. 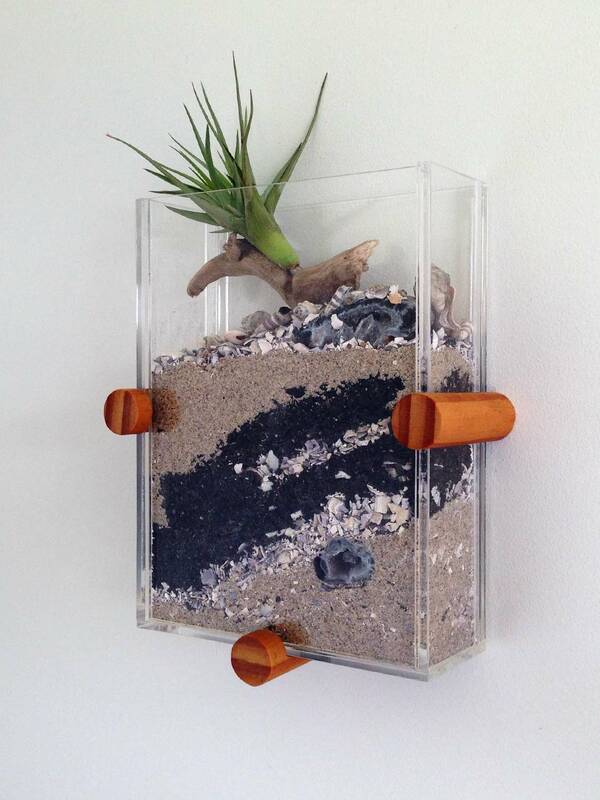 The good thing about the air plant is that it doesn’t need much water so there isn’t any water being poured on the sand, I’m pretty sure that helps keep the layers separate. I glued the airplant onto a piece of driftwood to keep it in place. For watering I put a few drops on it every few days from a squeezy bottle. I wanted the terrariums to be two different environments, this is the wet one. Both the plants in this one are ones that are meant to have similar conditions. The plan is for the plant on the left to cascade down the wall. I like the look of it but I’ve had trouble keeping the plants alive. There’s this whole thing where you have to water them. And not too much water, just the right amount. The layer of stones in the bottom is to help the soil drain, you’re meant to do that because there isn’t a hole in the bottom like a normal plant pot. But I was worried about over-watering it so didn’t water it enough and killed the plant on the left so had to replace it. Then I gave it too much water and almost killed the other plant. The air plant is much easier to look after. It might just be that my house doesn’t have the best conditions for these particular plants, but if it keeps being a problem I’ll probably re-do it with succulents instead. These are the finished wall fixtures for the angled terrarium. 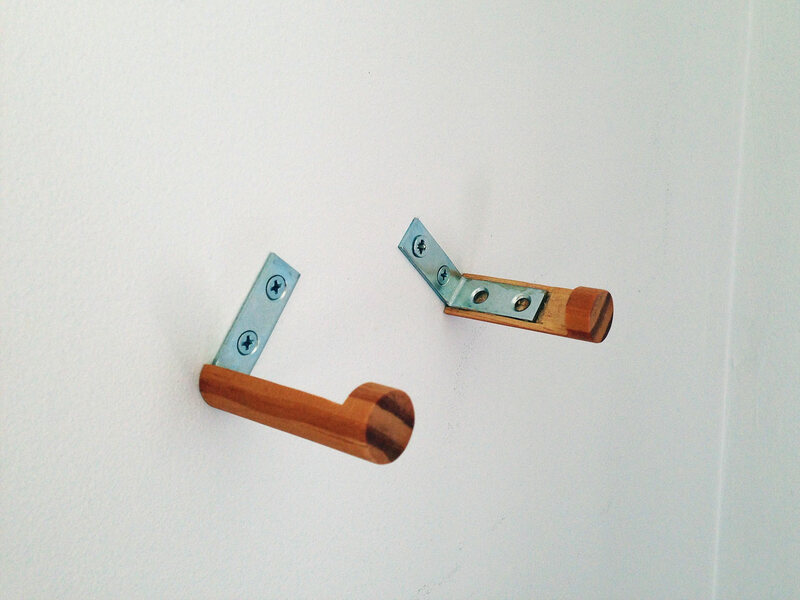 The metal brackets hold it to the wall and take the weight. 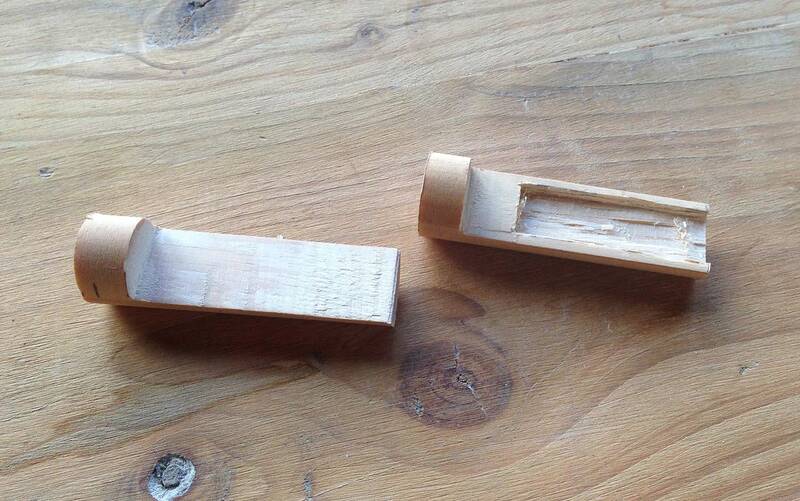 Next I used a chisel to cut out where the metal bracket would go. Again I used neoprene when I put it into the table vice so it wouldn’t mark the wood. 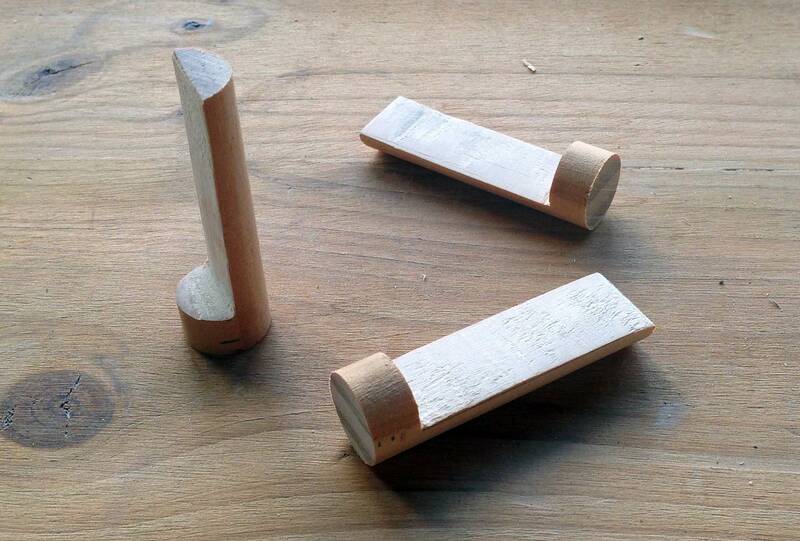 After sanding them I glued the metal brackets into the dowel, I used Liquid Nails. I didn’t think it was necessary to use screws as well since the wood itself wasn’t taking any real weight, it really just needed to be held on to look nice. Then I gave them two coats of danish oil to give a nicer colour and finish. The slightly tricky thing about attaching them to the wall was that they needed to be screwed into a beam to be strong enough (the terrariums are quite heavy). Because of the distance between beams I could really only get one fixture per terrarium to go into a beam. So for the rectangle one I made it the bottom one since that was the one that was taking most of the weight.